Lions, Komodo dragons, dogs, monkeys, and pheasants all have shared spotlights and tabloid headlines with celebrities such as Sharon Stone, Thomas Edison, and David Hasselhoff. Millet hilariously tweaks these unholy communions to run a stake through the heart of our fascination with famous people and pop culture. 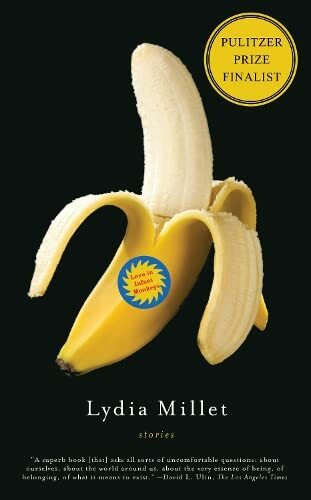 While in so much fiction animals exist as symbols of good and evil or as author stand-ins, they represent nothing but themselves in Millet’s ruthlessly lucid prose. Implacable in their actions, the animals in Millet’s spiraling fictional riffs and flounces show up their humans as bloated with foolishness yet curiously vulnerable, as in a tour-de-force Kabbalah-infused interior monologue by Madonna after she shoots a pheasant on her Scottish estate. Millet treads newly imaginative territory with these charismatic tales.